Even if we resist eating sweets and hit the gym every day, there are many of us who still can’t get rid of the packets of fat in your inner thighs, which—especially now that it’s summer—could really make us girls feel conscious when we’re wearing shorts, a bikini, or anything that exposes our legs and thighs. However, with the advancement of cosmetic technology, experts now have found a way to get rid of stubborn fat without the need for extensive surgery. Coolsculpting, a non-invasive, FDA-approved treatment, has been proven effective in reducing the amount of fat in certain areas of the body, including the inner and outer thighs. Through freezing the fat cells in your thigh area, this procedure can give you leaner, more sculpted legs you’ll feel confident showing off. Yes. Although the idea of freezing the fat sounds strange, this is how coolsculpting gets rid of the fats in the inner thighs to reveal the thigh gap. Compared to liposuction, the treatment can make your thighs look slimmer without going through the extensive process of surgery and recovery. So, how does it work? The machine used for this procedure cools down the target area to freeze the fat cells in the thighs, a process called cryolipolysis. As the cells freeze, they die and get eliminated from the body gradually. Best of all, this procedure involves no incisions or injections and, most importantly, no downtime. You can immediately go back to your normal routine right after the procedure. For the most part of the treatment, you will just be sitting and relaxing. Your physician will use an applicator that’s suitable for the contours of your thighs. In case you are not sure, Astique can help with coolsculpting your body in Singapore and since fat cells are more susceptible to extremely cold temperature than other tissues in the target area, they are frozen and dies off while the surrounding cells continue to operate normally. In the next three weeks to four months, your body gets rid of the crystallized fat, leaving your with slender legs. Depending on the size of the packets of fat you want removed, you may need several sessions to achieve desired results. For some patients, a fat reduction of 20 percent is enough to achieve optimum result. But for others, more work may be required to get the desired outcome. During the consultation, your doctor will ask about your personal expectations from the treatment and whether they are achievable with this sculpting method. If your doctor finds that you’re a good fit for the procedure but needs to reduce more than 20 percent of fat, you will have to work together to come up with a treatment plan that may require two or more sessions. It is 100 percent safe to undergo multiple coolsculpting treatments, provided that they are well-spaced out to avoid too much stress to the treated part of the body. 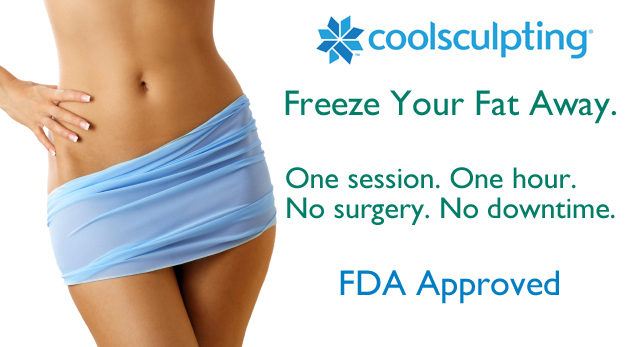 Coolsculpting is FDA-approved to kill fat cells, and has proven to reduce fats in the inner and outer thigh by 20 percent in four to six months. In FDA researches and trials, 86 percent of patients saw dramatic reduction of fat in their thigh area in a span of four months. The results gradually appear and lasted for years, as long as you maintain a healthy diet. So, what can you expect after the treatment? In as little as three weeks, your legs should have smaller bulges and more sculpted appearance. And when full result is achieved, usually after four months, you should feel more confident with the way you look in the clothes you wear. Your main goal for this procedure is to feel happy and comfortable in your own skin. Coolsculpting is perfect for almost anyone who wants to reduce the amount of fat in their thighs. However, it’s not a weight loss solution. Rather, it’s for people who are already living a quite active lifestyle, but can’t get rid of stubborn fat on their inner thigh area no matter what diet and exercise they do. If you are among those busy people in Singapore who doesn’t have the luxury of time for an extensive recovery period, coolsculpting if your best alternative to surgical fat-reduction procedures. Likewise, if the idea of having to undergo a surgery frightens you and makes you feel uncomfortable, you can relax knowing that the sculpting procedure involves no needs or incisions. Your physician only needs to make sure that you have enough packet of fat for the applicator to create suction. Patients in Singapore have reported to see results as early as four weeks after the treatment, and full results seen typically within four to six months. Since the frozen fat cells are permanently eradicated, results are expected to last for a lifetime. However, weight gain is still possible as the remaining fat cells in the area can still expand if proper diet is not observed. When fat cells are flushed out of the body and thigh area appears leaner, you can maintain the results with healthy diet and regular exercise. As mentioned, coolsculpting is ideal for people who do not want to take time off from their day-to-day lives. There are no incisions, needles, and drugs involved. After an hour of lying comfortably, reading a book or listening to music, the treatment is done. Coolsculpting is not just any treatment; it is FDA-approved and has been proven effective by many patients in Singapore. So if you are looking for a treatment that can give you the most coveted thigh gap sans the hassle of traditional fat-reduction procedure, coolsculpting in Singapore is your safest and most effective choice. This entry is filed under Health Plan.